This month we check in to see how the shoe is holding up after one month of day-to-day skating and look at a few of the key areas of wear. 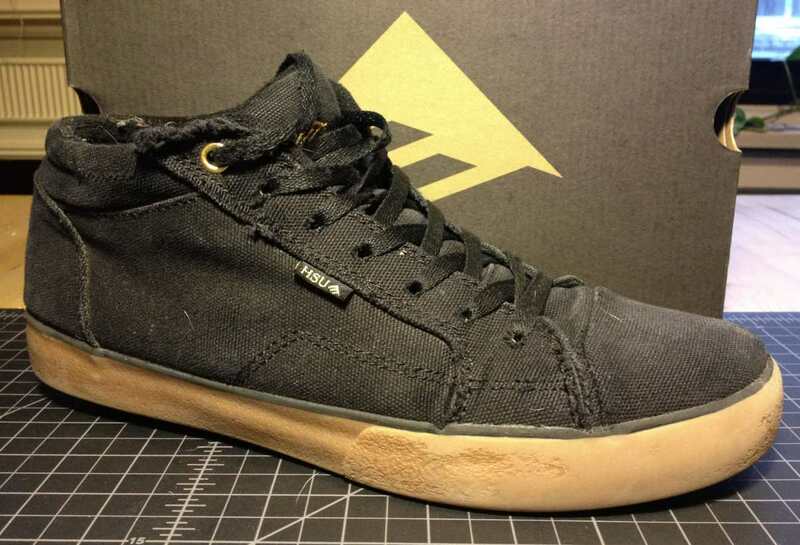 These shoes where skated nearly every day for the last month. I skate about 3 miles round trip to and from work each day. Mainly ollies on and off of curbs. 10 skate sessions of 2 hours or more in the streets. 3 Skate sessions at the park, (mainly transition). This is how the shoes looked fresh and clean, pre-lacing. A similar angle of the same goofy foot shows the faux-foxing tape of the stiFusion starting to wear. Nearly all of the texture is gone. The top of the lacing cage also is a little tattered and a few of the seem lines are beginning to show signs of fraying. I seldom do switch tricks, so here is a good comparison of the toes. 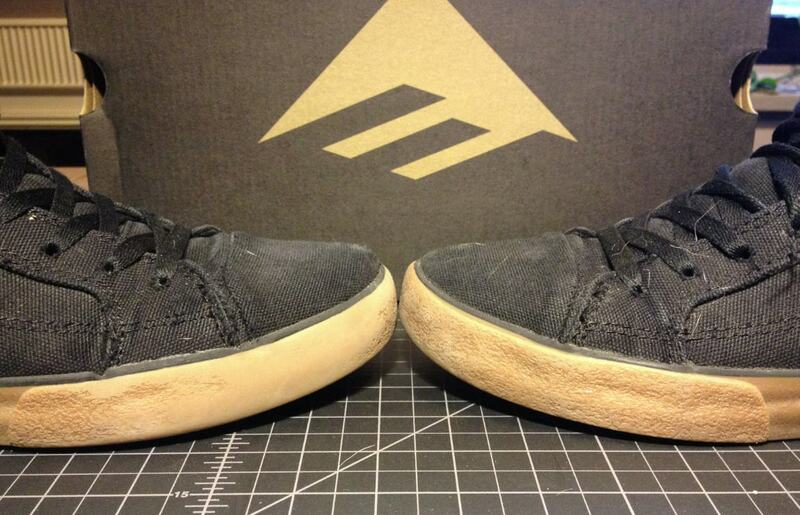 On the left shoe (actually my goofy shoe) you can see the top of the toe canvas wearing from flip tricks. 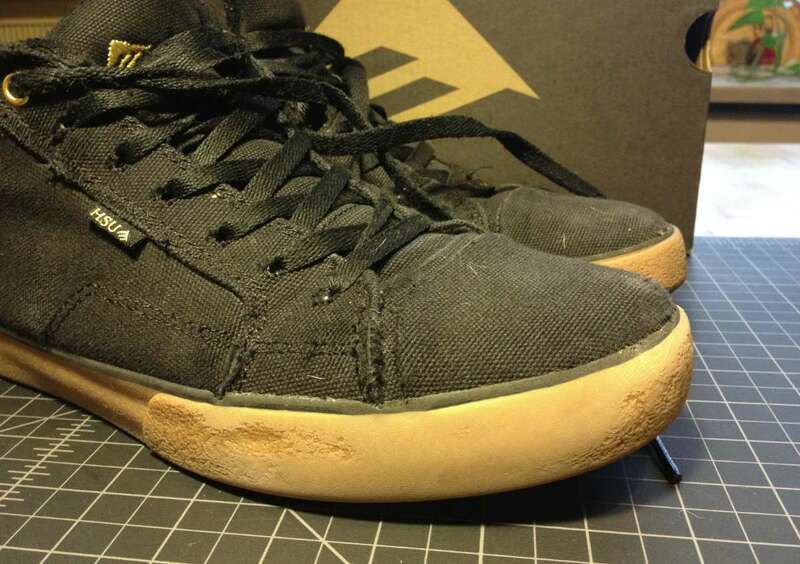 Despite the abrasion it still feels like a solid toe cap when I first skated them. A look at the soles reveals my commute. The position of the shoes is again reversed. The shoe on the left if my right shoe, my goofy front foot. The balls of my feet have warn away the tread bald. On the left shoe you can see signs of my toe dragging. A bad habit i know, but so far no breakage. The heel of the sole is holding up incredibly well for all the heel stops I’ve been doing. So far so good. I’ve been very pleased with the board feel. My feet have not felt bruised or overly sore, and in general the Hsu 2 was ready to skate out of the box. 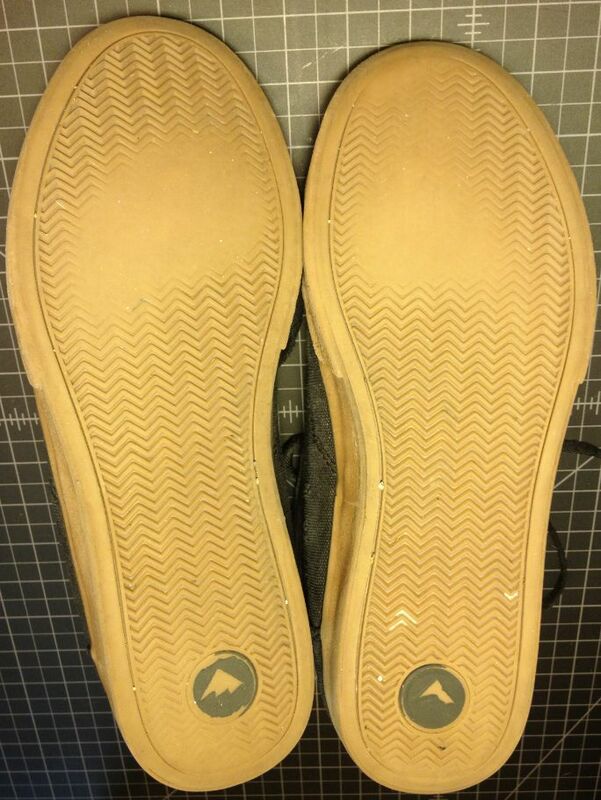 The biggest change I have noticed so far is the treads on the soles, which honestly doesn’t burden my riding so much. My one complaint is lacing. I am notorious for stomping into already laced and tied shoes. This is virtually impossible with the stiff heal caps which means I have to loosen down to the fourth lace hole to get my feet into the shoe. I really like how stiff the heal is though, so I would like to see metal eyelets on the lace cage. This would make the hole process go much faster. Take one last look at these bad boys. Minor damage for a good amount of mid-spring skateboarding. If I gave in now and slimed them with shoe-goo I imagine they could make it till the end of summer. 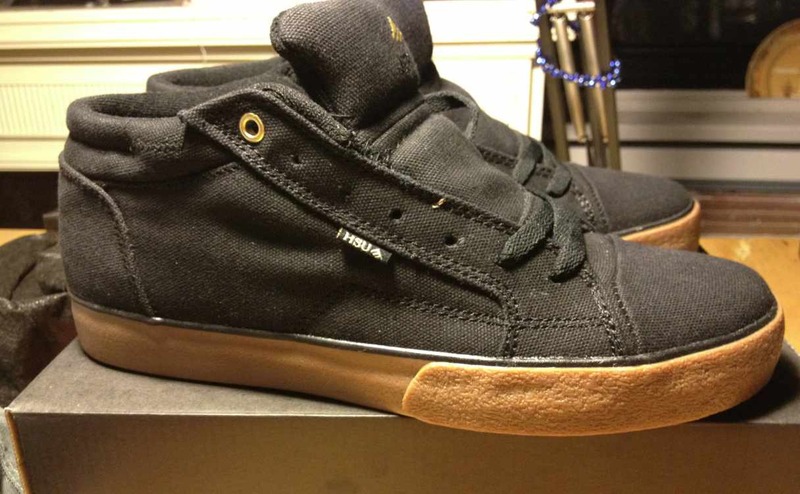 No time for that though, they have a date with some Black Magic grip tape. the soles always wear out for me first, but that is because i pre coat the shoe in shoe goo. 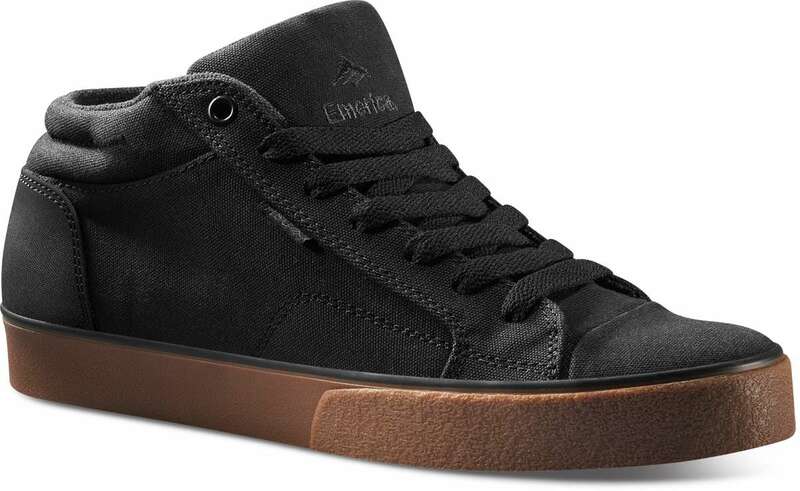 i made my emerica francis shoes last almost 2 years, but not skating all the time.